5.2 Organisational aspects - which department deals with CSR affairs? Figure 8: World population (billions) 1950-2050 (see United Nations Development Program 2000). In recent years, more and more people expressed their concerns about some companies’ performance. Mainly not about their financial performance, but about their social performance. About their attitude towards the environment. About the treatment of employees. Consumers, governments, environmentalists, trade unions, but also managers felt that there is a need for change in business life. The concepts of Corporate Social Responsibility (CSR) and Corporate Citizenship are seen as the way where business needs to go in the future. The basic idea of the concepts is that companies are a vital part of the society and that they cannot ignore this any longer. Business has both the power and the responsibility to behave in a way that satisfies not only shareholders, but also employees, customers, the environment, the community, and the society as a whole. In this paper I will give an overview of the new approach to business responsibility. It is an incredibly huge topic, related to many important issues. It would have been possible to write hundreds of pages about subtopics like the employee-employer relationship or environmental issues. I chose a different approach and will give a panoramic view of this fascinating and complex topic. Of course, I had to focus on some of the most important issues, but I consider a holistic approach as very important, as it shows the interrelation between business and its stakeholders. 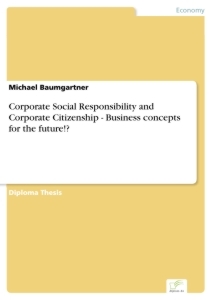 After a general introduction to the topic in Chapter 1, I will define the different areas of Corporate Social Responsibility and give a short summary of the history of CSR. Following this, I will present the reasons why the topic of socially responsible companies becomes more and more important. Chapter 4 will focus on an introduction of the main issues of CSR, including Human Rights, environmental issues, corporate governance and many more. In the main part of this paper, Chapters 5 to 9, I will explore the issues of CSR which I consider most important. I will present the “hottest topics” and how business responds to them. This will not only be done theoretically, but I will also give examples of companies who tried to go new ways. Even though I think that the new approach called CSR is definitely a top business approach for the future, I tried to question the approach and to find critical points, which will be presented directly in the different chapters. The concept of Corporate Social Responsibility as a whole is yet not very popular in Austria, as it has its roots in the US and the United Kingdom. But CSR is not completely new, it is an approach that combines elements of business ethics, social and environmental regulations, governmental affairs and many more. Some topics covered in the CSR approach have a long tradition in Europe, like the employee-employer relationship in Austria in the form of the so-called “Wirtschafts- und Sozialpartnerschaft”. The new and very central point of CSR is that it puts the stakeholder relations at the heart of the company’s strategy. It is more than just doing the necessary evil to satisfy the stakeholders, it is a proactive approach. And as it is a young topic, it is constantly changing and developing. A lot of research will have to be done, standards to be set, a lot of questions to be answered. These facts did not make it easy to find the crucial points to be presented in this paper, but it made the work and the research rather exciting and fascinating. “Tomorrow’s successful companies can no longer afford to be a faceless institution that does nothing more than sell the right product at the right place. It will have to present itself more as if it were a person – as an intelligent actor, of upright character, that brings explicit moral judgements to bear on dealings with its own employees and with the wider world” (Economist 1995). “The walls of our company are becoming increasingly transparent. We are opening up more and more to engage with our stakeholders in order to understand their needs and concerns. We see no contradiction between being profitable and being transparent and ethical.” (Novo Nordisk 2000, p. 1). “Tony Blair has, without fanfare, created a minister for Corporate Social Responsibility - risking fresh accusations of interfering with business. The prime minister gave the post to Kim Howells, a junior minister at the Department of Trade and Industry who is already responsible for competition and consumer affairs.” (Groom 2000). “$ 1.3 trillion passes through the financial market daily – 90 % as speculation. One trillion dollars could feed the entire world for two years.” (Murphy 1999). “At our company we have a social responsibility committee. It used to deal with questions like: ‘Which charity should we give to?’ Now it’s: ‘How do we run our business?’ (Knight 1999). In recent times the buzzword “interdependence” was used a lot when newspapers reported about the relationship of business, government and the society. To explain what interdependence means, it is useful to define the terms dependence and independence before. Dependence means “the state of being determined or conditioned by others”, independence means “freedom from outside control” (Webster’s New Encyclopaedic Dictionary 1993, p. 269). Interdependence is defined as „depending upon one another“. The relationship between business, government and the society must be seen as an interdependent one. No participant in the system is completely independent from another one. Every step taken by one of the participants influences the others. The viewpoint of an interdependent relationship is based on the so-called “system theory”. “According to this theory, all living organisms (systems) interact with and are affected by other forces in their host environments.” (Post et al 1996, p. 6). One result of this close relationship between all the social groups is that all actions taken by one group have impact on the others: all business actions have a social impact, the survival of business depends on government’s actions and so on. To understand the interdependence of companies, governments and the society it is useful to look at the “stakeholder concept”. Stakeholders are “all groups affected by, or that can affect, an organisation’s decisions, policies, and operations.” (Post et al 1996, p. 8). As this definition is rather broad, it includes many individuals and groups of people. In the 1950ies, the focus was mainly on three groups of stakeholders – employees, customers and shareholders. Thomas J. Watson, Chairman of IBM at that time, described the management’s role as one of “balancing this three-legged stool” (Post et al 1996, p. 9). Today, the group of stakeholders is seen much broader. “Primary stakeholders are groups that affect directly the company’s ability to carry out its primary purpose of providing society with goods and services.” (Post et al 1996, p. 10). Primary stakeholders include employees, stockholders, creditors, suppliers, customers, competitors, wholesalers and retailers. Secondary stakeholders are those groups in society who are affected, directly or indirectly, by the company’s secondary impacts and involvement. - the community at large. Sometimes it happens that stakeholders share a common point of view on a particular issue or problem. If this is the case it might happen that stakeholders form „temporary unions of stakeholder groups, so-called „stakeholder coalitions“ (Post et al 1996, p. 15). These coalitions often increase the power of the different stakeholder groups. Corporate Social Responsibility is quite „trendy“ at the moment. Companies like Shell establish departments dealing with CSR (Wade 2000), and magazines publish articles and even special editions about the topic (Rhys 1999). Managers are talking about it, but what exactly does it mean? What are the differences between Corporate Social Responsibility, Ethical Trading, Corporate Citizenship, Sustainable Development, Social Accountability, and Responsible Business? It is definitely not easy to answer this question. As it is a young, and dynamic topic, there are no clear definitions. In order to avoid confusion, it is useful to have a short look what the different terms might mean. These terms focus on the company as a member of society, as a citizen, including all its rights, but also all its responsibilities. “All companies have economic, social, ethical and environmental responsibilities, some of which require compliance with the law, others requiring discretionary action to ensure that the company does not knowingly operate to the detriment of society.” (McIntosh et al 1998, p. 284). According to Westebbe/Logan, companies should “[…] commit themselves not only to their business, but also to the solving of society’s problems.” (Westebbe/Logan 1995, p. 17). CSR is therefore about a company’s commitment, involvement, and the two-way relationship between society and corporations. At the heart of the CSR movement are issues of transparency and accountability so that all stakeholders, and the company itself, report on its ethics, financial, social and environmental affairs. 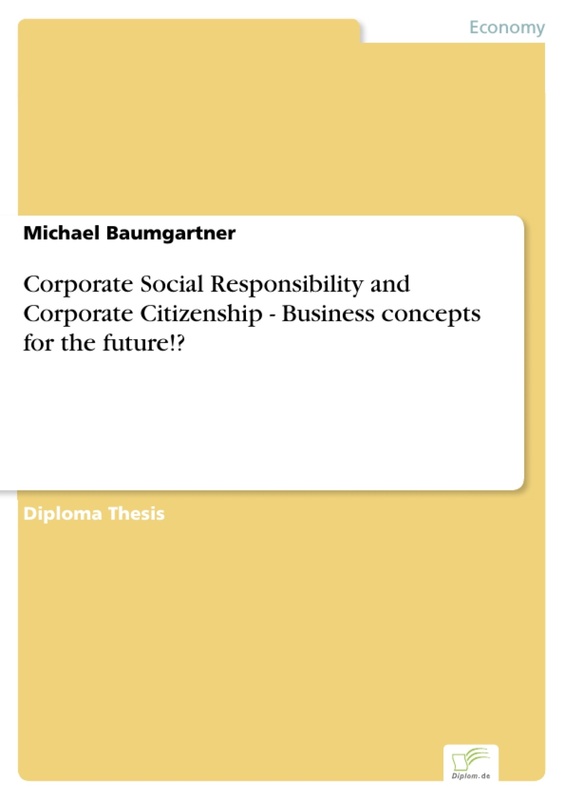 In this thesis I will use the terms Corporate Social Responsibility and Corporate Citizenship synonymously. CSR is not only about responsibilities, but also about ethics; Ethics in dealing with customers, employees, and the environment. Ethics come from inside a person, from their beliefs. As every individual has different ethical beliefs, there is no definition of what is ethically right or wrong, but it is a point that managers have to keep in mind while doing business. Therefore, ethics are an important part of the concept of CSR. Topics like ethical auditing and ethical investments will be addressed in this thesis. Another important point is that social responsibility reflects also cultural values and traditions and takes different forms in different societies. - Value of the environment for the contribution it makes to life on earth, whether in terms of physical resources, recycling, beauty, amenity or religious significance. - All people have a right to environmental resources including materials and beauty. - Decision making about the use of environmental resources must be based on an awareness of all those who may be affected by the decision, including people in other parts of the world and unborn generations (McIntosh et al 1998, p. 101). When reading this, the link between Sustainable Development and CSR is easy to find: the commitment to Sustainable Development should be a basic value of all socially responsible companies. It is better for all members of society and for companies to do business responsibly and behave as corporate citizens. In some fields, for example in environmental issues, governments have set standards and minimum requirements that must be met. The effect of this is that companies can be made accountable for their actions. This is one of the key points of the CSR concept: companies should be made accountable for what they do. Post et al even include this in their definition of Corporate Social Responsibility: “CSR means that a corporation should be held accountable for any of its actions that affect people, their communities, and their environment” (Post et al 1996, p. 37). It is definitely very difficult to set standards for social accountability, but some standards have been developed over the years (see Chapter 9). - How the organisation is working within its own values statements. (McIntosh et al 1998, p. 241). For many years, the only bottom line that managers and CEOs cared about was the financial bottom line. The only thing that was important for the shareholders was to earn as much money as possible with their shares. Today, managers care about more than the financial bottom line. They have to keep the so-called Triple Bottom Line in mind, which includes “economic prosperity, environmental protection and social equity.” (Elkington 1999, p. 397). The idea of Corporate Social Responsibility appeared in the United States around the turn of the twentieth century (Post et al 1996, p. 41). Corporations at that time came under attack for being too big, too powerful, and guilty of antisocial and anticompetitive practices. As a result, some of the wealthier business leaders – like Andrew Carnegie or Henry Ford – became great philanthropists. These early ideas about business’s expanded role in society resulted in the emergence of two broad principles which are the historical foundation for the modern idea of Corporate Social Responsibility (Post et al 1996, p. 41 ff.). - The Charity Principle: The idea behind this principle is that wealthier members of society are obliged to share their wealth with poorer people. This support for needy people was especially important at the beginning of this century when there was no social security system, meaning no medical care for the poor etc. For many years the support for the needy people came from private persons, but “[...] in the 1920s, much of the charitable load was taken on by business firms themselves, rather than by the owners alone.” (Post et al 1996, p. 42). For many of today’s firms, CSR results in this kind of participation in community affairs. However, charitable giving is not the only form that social responsibility can take. - The Stewardship Principle: According to this principle, managers are stewards, or trustees, for society. They control vast resources whose use can affect people in fundamental ways. “Because they exercise this kind of crucial influence, they incur a responsibility to use those resources in ways that are good not just for their stockholders alone but for society generally.” (Post et al 1996, p. 43). This kind of thinking produced the modern theory of stakeholder management (see Chapter 1). Today the topic of social responsibility is widely discussed, especially in the United States. The concept of Corporate Citizenship still includes both, the Stewardship and the Charity principle, but it is more than only this “social” part. As described before, it includes economic, ethical and environmental responsibilities as well. The idea behind Corporate Social Responsibility is that companies do not stick to business ethics, fair trade etc. because of legal requirements, but because of voluntary responsibility. Legal requirements often provide a framework for all the members of society, they provide the “playing field”. But co-operations that comply with laws and public policies are meeting only a minimum level of social responsibility expected by the public. It is the least that is expected by the members of society. So, why should a company then exceed this minimum level? Why should it invest money to do good? Some people argue that the only truly socially responsible corporations are those motivated by a strong desire to do social good. This is definitely not true for most of the companies. Normally, the reason for doing business is to earn profits. But still, there is a growing number of companies that see the need for social responsibility. What is their motive to exceed the minimum expectations set by governments? Post et al sum it up in their book as follows: “Socially responsible actions frequently occur as a result of mixed motives – partly from a genuine desire to promote worthy social goals, partly from wanting to project a caring image of the company, and partly from the knowledge that government may step in if business fails to act on its own.” (Post et al 1996, p. 53). Do socially responsible companies sacrifice profits by working conscientiously to promote the social good? Do they make higher profits, better-than-average profits, or lower profits than corporations that ignore or flout the public’s desire for a high and responsible standard of social performance? In the short run, all social programs will impose monetary costs and reduce company profits. But what is lost in the short run may be gained back over a longer period of time, and the organisation may experience an increase in its long-term profits. To maximise profits is usually the goal of any company, but maximum profits are often not optimum profits. An optimum profit is a return that is considered to be satisfactory by the managers or the owners of the business. Socially responsible actions may lead to optimum profits by diverting funds that otherwise could be used to drive profits close to the maximum level. Companies often focus on earning high profits and paying dividends to the shareholders. But shareholders are not the only stakeholder group that a corporation’s management must keep in mind. Management’s central goal should be to promote the interests of the entire company, not just any single stakeholder group, and to pursue multiple company goals, not just profit goals. It is a matter of fact that social responsibility of companies became more and more important in the last years. People nowadays care where the product they buy comes from, who produced it, which ingredients it has etc. But it is not only customer behaviour that changed. In the last years men realised that the ecological and natural resources will not be available forever. Globalisation changed the way of doing business. The society had to face social challenges like the enormous costs of social systems. Many of these forces changed the way how business is done. In the following chapters, these forces will be discussed. To understand the growing importance of social responsibility, it is necessary to look at these forces that changed business life in the last years. In recent years, many companies have been re-thinking their organisational structure, their core competencies, their values. Many firms had to set free employees in order to reduce costs to stay competitive. This “re-engineering processes” are very challenging for firms that try to act in a responsible way. Other social challenges include the rapid progress in the field of communication, e. g. cellular telephoning or the use of the Internet. The lack of Internet access for many people in developing countries, for example, will lead to what experts call the “digital divide”. People in Western countries will have the chance to use the Internet for shopping, gathering information about certain topics, communicating etc. Others, without Internet access, do not have these opportunities. And, even worse, these people will never have a chance to get high-paid jobs, as Internet skills and other computer skills are absolutely necessary for up-to-date jobs. “Digital divide” does not only mean that there is a gap between first and third world countries, but also between higher educated and lower educated people within one country. Today, many consumers care about the origin of the products they use. They want to know where they were made or who produced them. They want to know about the environmental damage it can cause. This phenomenon appeared only recently. The question is: Did people 50 years ago not care where the products they used came from? The answer might be related to the use of media as well as to the fact of globalisation. Due to the rapid growth of the number of Internet users and especially due to broadcastings on TV and radio, consumers get a lot of information from all over the world. No matter where a ship ran to ground or a war began – people all around the world hear about it within minutes. People also get to know about living standards in other countries, child labour, environmental damages caused by toxic waste and so on. This is the moment when many people start wondering how this can happen, and what they can do to change this situation. The relation between ethical expectations of consumers and globalisation can be described as follows: Some decades ago, no “global players” or multinational companies existed. Consumers bought all they needed from local producers “just around the corner”. They knew the farmer they bought their meat from, or the tailor who made their clothes. If they were not satisfied with the quality of the product or the way it was produced, they just did not return to them. Today, in a global economy, goods are produced in a lot of different countries. Many people do not know where the products they use come from, but if they somehow get to know the fact that one product is made in an “unethical” way, they will stop buying it. Today’s customers demand from business to be both ethical and economically efficient. “To maintain its public support and credibility – that is, business legitimacy – business must find ways to balance and integrate these two social demands: high economic performance and high ethical standards” (Post et al 1996, p. 22). The economy all over the world has undergone many changes recently. One of them is for example the so-called “globalisation” – one of the buzz words of today. Globalisation is defined as “…the process of increasingly large organisations dominating trade and social relations, most of them businesses, and the development of electronic webs that provide the basis for a 24 hour economy and instantaneous crossüborder communications” (McIntosh et al 1998, p. 287). - Telecommunications: e-mail, telephones etc. made it possible to communicate on a global basis – at least in the industrial countries. - Monitoring: through satellite technology, the world can be monitored for military movements, rainforest destruction etc. - Disease: the elimination of the AIDS virus becomes a global problem as well as deaths by car accidents etc. - Ecology: “the sight of planet Earth from space has helped us to realise that we share one world and has enabled us to understand its fragility and our position in the universe.” (McIntosh et al 1998, p. 18). - Connectivity: we are connected globally through shopping, travel, resource use, pollution and the media. The effects of globalisation on business are multiple: money is free to move, exchange rates flow constantly, companies have the possibility of outsourcing to the cheapest suppliers or producers anywhere in the world, mergers and acquisitions take place, trade unions are established, wealth disparity between countries increases as well as the differences in the living standards. Doing business has definitely become more and more complicated, and therefore, clear company values and ethical principles are more important and necessary than ever to any company around the world. Beginning sometime in the 1970s, economic and political changes effected many countries all over the world. In many countries, governmental power and the role of government in the society were challenged. In Russia, for example, these movements led to political changes like deregulation and privatisation (glasnost, perestroika). Governments in many of the former communist countries in Eastern Europe were forced to change the political and economic system as well. Democracy and a free economy were demanded by the people. In Austria and other European countries, privatisation and deregulation of former governmental industries took place in the 1980s. Only recently, even China started to open its markets for foreign investors. These political forces have become a central part of the world business climate. Nowadays it is possible for companies to invest in Russia, to trade with companies in China. Corporations and their managers cannot ignore these political changes. Their task should be to integrate changing political realities into a corporate business strategy (Post et al 1996, p. 28). “It is today possible, to a greater extent than at any time in the world’s history, for a company to locate anywhere, to use resources from anywhere to produce a product that can be sold anywhere… The challenge is to use our influence to make sure governments are not short-sighted and do not short-circuit the process.” (Friedman undated). The perception of the value of nature and environment changed rapidly in the last years, especially in the highly industrialised countries. Some years ago, nobody cared about air or water pollution, about toxic waste, about nuclear power plants. But due to reports in the media and activities of non-governmental organisations (NGOs) and non-profit organisations (NPOs) like the World Wide Fund for Nature many people became aware of the problems we face. When people saw pictures of the catastrophe of Chernobyl, the deforestation of the rain forest, the effects of the change in climate, or the hole in the ozone layer, they knew that these things could have serious effects on their life one day, even if they lived far away from the places where these things happened. Actually, there are numerous critical issues in CSR and it would be impossible to present all of them in this paper, so I chose the ones most discussed at present. “Corporate governance is the system by which business corporations are directed and controlled. The corporate governance structure specifies the distribution of rights and responsibilities among different participants in the corporation, such as, the board, managers, shareholders and other stakeholders, and spells out the rules and procedures for making decisions on corporate affairs. By doing this, it also provides the structure through which the company objectives are set, and the means of attaining those objectives and monitoring performance”. - How transparent should boards be in their decision making and to whom should they be accountable? - Who are boards working for? Shareholders? Themselves? A wider range of shareholders? - What competencies should directors have? - How do companies hold their employees accountable? - Many people are appointed to boards as a reward for long service or loyalty, rather than because of competence. - In some cases, board members are appointed to support over-powerful chief executives, who do not want to be questioned too closely. - Board members can become too familiar with each other and develop a common mindset. - Many board members do not have the necessary competencies to serve as directors and trustees of the shareholders’ and society’s interests. Good corporate governance is central to responsible Corporate Citizenship. In most cases, the major investors in public companies are either institutions such as insurance companies and pension funds (especially in the United States and the United Kingdom) as well as banks (especially in European countries like Germany and Austria) (McIntosh et al 1998, p. 85). The public increasingly wants to know where they are investing their funds and what criteria are being applied in making investment, research and manufacturing decisions.